This is a list of all Cosmoteer mods that have not been abandoned by the author and have been updated relatively recently. Mods have been grouped into types and compatible versions to allow users to easily search for mods; if you are a mod author and would like me to add your mod to the list or correct an error, please leave a comment on the spreadsheet or contact @IVIemories by replying to this thread/messaging him on discord. Mods that are large enough to have their own mod talk section will be put under this section instead. ABH by @Lafiel: Major weapons and part mod. Arguably the biggest and certainly the oldest mod for Cosmoteer that is still being developed; ABH focuses primarily on end game content and contains hundreds of new parts and weapons spread across several tech levels. Introduces various new mechanics into the game as well as various cosmetic parts. AWV and Stargate by @Akinata: Mod that primarily focuses on weaponry, including some innovative ones such as suicide bombs. Blood Cult by @ZergRush99 and @Drakador_Chaos: Mod that revolves around the Blood Cult faction and their living ships. Has a very unique aesthetic. Bubbet's Placeholder mod by @Bubbet: A utility focused mod that primarily adds new and interesting mechanics into the game, including energy wires, teletubes and regenerative armour. Star wars: Cosmos divided created by @Classicjam and maintained by the SW-ACD team: Star wars focused mod with lots of Star wars weapons and ships to fight against in bounty hunter. Includes roof turrets, thrusters, astromechs and other Star wars related parts. Mods that are in bold and italics are mods that I know to be of a high quality and personally endorse. You forgot Decomod and Archon Plasma. Wait, wait, wait, does that mean that Automation ++ is the major mod, and Drones ++ is a minor mod? 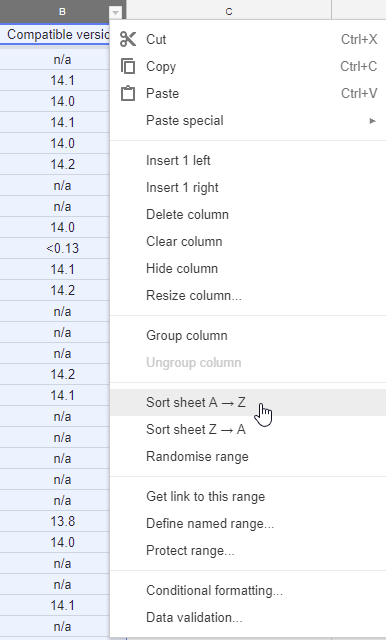 Perhaps you could add my mod to the spreadsheet? It's a small one, but I intend to expand it further. It is compatible with 0.14.4. A lot of mods are missing version numbers and categories because it was not stated anywhere on the page. I will be adding these myself through in game testing, but it would be a lot easier if you could just tell me the compatible version/mod category. Also mod authors with their own mod talk section: Part of the reason for this list existing is to promote Mod Talk mods, so please please please please PLEASE start using your mod talk sections instead of staying here. IVIemories All mods that was compatible with 14.0 should also be with 14.1.
awv&targate (and bloodcult should too) are compatible up to version 14.1 of cosmoteer. My mod also feature its own bounty mod as an addon with custom difficulty, ships (created mostly by awv&stargate community) and tiers! Bloodcult has its own custom bounty mod too with its own ships. Good job on finally creating a mods list. Bubbet It's not stated anywhere in your mod talk section, or if it is then it's in the comments which I am not about to go through. IVIemories I think you should mention that Jesus is the current "director" of the starwars mod bc a lot of new people have tried to talk with classicjam about bugs and crashes. akinata jbox1 Please post your mod download in your own mod talk section, otherwise I won't link to the mod download thread. One of the purposes of this mod list is to promote the major mods and move them out of this section into their own private sections; this way new mods won't get pushed down by various large mods which get commented on more frequently. tho the mod talk section may need another name like "big mods" or something that indicate that some particular mods are here. 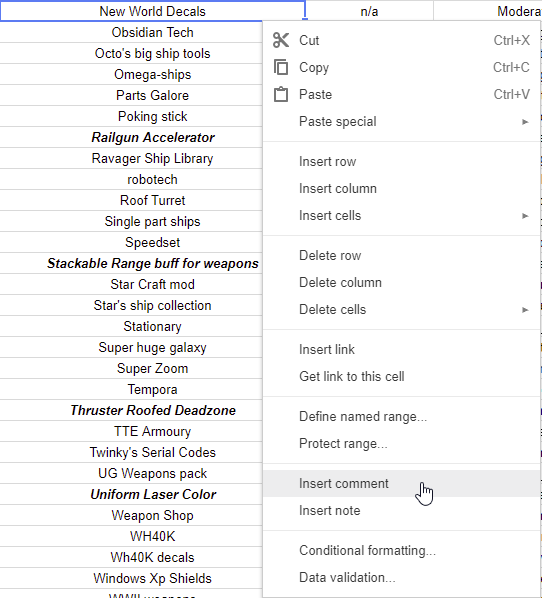 I think there should be some way of knowing on the spreadsheet which mods are major and which aren't. I know it says on the Post itself, but some lazy people (like me) don't read the entire post and just skim through it looking for the spreadsheet itself. Maybe an asterisk (*) next to them with a note down at the bottom? UltraBlast I might add them to the spreadsheet with a coloured background, but I'm still deciding on if it's even necessary. Zerg has left developement of the BloodCult mod, the current current dev is me. Here´s the mod-talk link, currently busy with some other stuff so updating to 14.2 might be delayed a few days. Drakador_Chaos I've added you as a co-dev. IVIemories Great work on this! I somehow got my name spelled Catpain Redstone, but I am amazed at the level of research this must have taken! Bloodcult should be 14.2 compatible now, also, I guess you could add a link to the cosmoteer modding discord somewhere in the thread.